It was the best of times; it was the worst of times . . .
Well actually that might be overstating things a bit, but I was certainly in a quandary. There I was with my surround processors remote, which could control almost every component in my home-theater rig (but rather clumsily). Also, I had my el cheapo universal remote, which could control all of my video equipment, but none of the two-channel gear that I also had in my home-theater rig. Most inexpensive universal remotes will control just about any combination of TV, VCR, and DVD player, but what if you have a surround preamp, CD transport, integrated amplifier, or laserdisc player in your system as well? "Simple" you say to yourself, just go out and buy one of the many fine universal remotes from Marantz, Theater Master, or Philips. Okay, but what if you do not want to spend $300, $200 or even $100? What I really wanted was a relatively simple and inexpensive remote that could control my video equipment on a day-to-day basis, but which could also occasionally control my other audio components. If you are anything like me, I rarely require my surround preamps remote to do more than control the volume of the home-theater system. The same goes for my two-channel integrated amplifiers remote. The functions required of my CD transports remote are a bit more numerous, but still nothing extraordinary. The problem with most remotes in the $20 to $30 range (my budget) is that they cannot control a CD transport or surround processor, let alone an esoteric integrated amplifier. In addition to the usual complement of mass-market video equipment in my home theater, I have a Teac VRDS transport, a Sherwood Newcastle surround processor, and a Krell integrated amp. Would I be able to find a remote that could meet my needs at such a bargain-basement price? And maybe, just maybe, I was hoping that I could find a remote that would far surpass my wildest expectations with all kinds of unexpected and unbelievable features! Previously I had used a universal remote from One For All, which operated all of my video gear and the volume control of my Nakamichi receiver. However, it could not control any of my other two-channel gear. Then one day as I was walking the aisles of my friendly neighborhood discount superstore, I noticed another universal remote from One For All called the Cinema 6 that looked remarkably similar to the unit I was currently using, but was just a little bit different. As I read the packaging, I was overjoyed to learn that this one was a learning remote that cost only a few dollars more than my older non-learning model. I took one up to the till and paid the paltry sum of $19.99 CDN for it (approximately $14.00 USD). When I got the Cinema 6 home, I discovered that much like its predecessor, it could not operate my CD transport, surround processor, or integrated amp using its built-in codes. And also, it had only four keys that were learning. This meant that for each device that it controls, only four keys can learn new functions. For me, this was not really a problem because I only wanted to control the volume on my surround processor and integrated amp, which would require only two learning keys, and chapter skip (both forward and reverse) and stop for my CD transport (three learning keys). Perfect right? Well almost -- I really would have liked to be able to directly access tracks on the CD transport via the numeric keys. Programming the learning keys was quite straightforward. You just punch in a combination of keys to tell the remote which of the four learning keys it will be programming and the device to which it will be assigned. You then point the other remote at it and press the key to be learned from. After I programmed all of the functions that I wanted into the Cinema 6, it worked pretty much like you might expect and without incident. The only problem was that the learned volume control for the Krell integrated was a little bit too sensitive to its signal. It tended to overshoot the exact volume that I wanted. Other than that, you really could not ask for anything more from a $25 remote. Another nice feature of the Cinema 6 is its ability to change the assignment of its device keys. Most inexpensive universal remotes are set up to operate only one TV, one VCR, one DVD player etc., but what if you have more than one of these devices in your system? The Cinema 6 allows the user to program each of its device keys to control any type of device. For instance, the cable-box device key can be changed to allow the control of a second VCR or DVD player or whatever is desired. Most other remotes only allow the cable-box setting to control a cable box, not allowing one to reprogram it to control another device. The procedure to do this is a bit confusing, but it is thoroughly documented in the instructions. In general, the documentation is decently laid out with easy-to-read print and is bound in a handy little booklet. But there is more. The Cinema 6 also provides some "crossover" functions such as volume control for the TV, when the DVD or VCR is chosen; or play, stop, cue, review etc. of a DVD player or VCR, when TV is chosen. Some of the keys also glow in the dark to facilitate its use in low-light conditions. And finally, the Cinema 6 has two macro keys that can be programmed to play back up to 15 keystrokes. So anyway, there I was happily using my Cinema 6 from One For All with my system when one day I discovered the Jensen SC-570 remote in the A/V department of another discount department store. I looked more closely at the packaging, and the list of manufacturers whose components it could operate, and there in tiny little print was Krell. Could it be? Was it a typo or a mistake? Would this be the remote that controlled not only my home-theater equipment, but also my two-channel gear for the bargain MSRP of $34.99 USD and for which I paid only $29.99 CDN? Once again I rushed home to try out my latest find. When I got the Jensen SC-570 home, I found to my delight that not only would it control my Krell integrated, but also my Teac transport (the only inexpensive remote that I have found that can do this, other than the Cinema 6 with its learning keys). But alas, it would not control the volume on my Sherwood Newcastle surround processor. Well, I guess you cant have everything, at least not for under $35, in a remote. The Jensen was a bit difficult to program, especially because the DVD and CD devices are assigned to the VCR and RCVR device keys, and are accessed via the "Action" key. This is all a little confusing and not well documented in the instructions. The documentation is rather poorly laid out on a folded piece of paper that is just the right size to be easily lost. What I liked most about the Jensen remote was its built-in ability to control many high-end audio components and its cool back-lit buttons and ergonomic design. This looks like a much more expensive remote than it actually is. The SC-570 also features crossover functions like volume, pause, play, stop etc. of one component when controlling another, and a 25-minute memory for codes when changing batteries, which is very handy. The Jensen comes with codes to control components from such high-end manufacturers as Acurus, Arcam, CAL, McIntosh, Naim, Parasound, Proceed, Faroudja, Fosgate, Lexicon, Wadia and others. While I did not have components from these manufacturers to test the SC-570s compatibility, I was disappointed to learn that it could not operate a Marantz AV-600 surround processor that I had on hand, using the codes that were provided with the instructions. Both the Jensen SC-570 and One For All Cinema 6 have their advantages and disadvantages. The Jensen is a much nicer looking design, with the ability to control a wider variety of components with its built-in codes. The One For All, on the other hand, is more flexible with its learning function and the ability to reassign its device keys to control more than one of any type of device. Some may prefer the less ergonomic, but smaller size of the One For All as I did, but it is hard to fault the sleek, attractive design of the Jensen. The keys on the One For All are also much smaller than those on the Jensen, but I did not find them difficult to use. I did find the nomenclature and the placement of the keys on the Jensen to be more confusing than that of the One For All. Both units require four AAA batteries, and the Jensen will remember codes for up to 25 minutes when changing batteries, while the Cinema 6 is said to have "unlimited memory backup" when removing the batteries. Both units worked very well during my time with them, while having good range and a wide angle of operation. Wait, theres more! Just before submitting this review for publication, I came across a website dedicated to the One For All Cinema 7, a unit very similar to the Cinema 6 that I had been using for this review. The site states that these remotes have many undocumented, but very advanced and useful features. On the site it is reported that the Cinema 7 and Cinema 6 have the ability to accept "advanced codes" to access functions that are not normally available on programmable remotes, and sometimes not even on a devices original remote. They can also copy functions from one button to another and most importantly, they have the ability to allow almost any key to become a learning key (not just the four, as reported in the documentation)! And there are more tips and tricks that are too numerous to mention, that are all available on the website. Armed with this new information, I was able to program the Cinema 6 to control nearly every function of my television, my two VCRs, and my DVD player. I could also program in the volume, mute, and source selection of my Krell integrated amplifier; the volume, source selection, and surround decoding of my Sherwood Newcastle processor, and all of the functions of my Teac VRDS CD transport. While the Jensen SC-570 is a fine remote in its own right, with its handsome ergonomic design and extensive library of built-in codes for high-end components, it is literally blown away by the One For All Cinema 6. The ability to reassign individual and device-specific keys, in addition to the learning ability of nearly every key, make this a KILLER remote and an incredible value! The Cinema 6 does 90% of what something like the Marantz RC-2000 does, but for only one-tenth of the price! 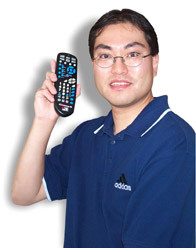 Buy this remote! Heck, buy two of these remotes. They will each cost you about the same amount of money as a DVD. Incidentally, if you cannot find the Cinema 6 or 7, Radio Shack sells something called the 6-In-1 Smart Remote (cat. #15-1994) which is based on the Cinema 6. So as I sit here with my Cinema 6 in hand and watch Kyle, Kenny, Stan, and Cartman spitting on Pip, I cannot help but think, "It is a far, far better thing that I do than I have ever done before..."